Every gardener can and should incorporate gourmet, medicinal mushrooms into their yards, gardens, and growing spaces. If you’ve been to this website before, you probably know that we’re fond of fungi. We do a lot of wild foraging and we also grow gourmet, medicinal mushrooms in our own garden. We live at the base of the Appalachian Mountains in Greenville, SC. That puts us smack dab in the middle of one of the premier mushroom foraging areas in the world. 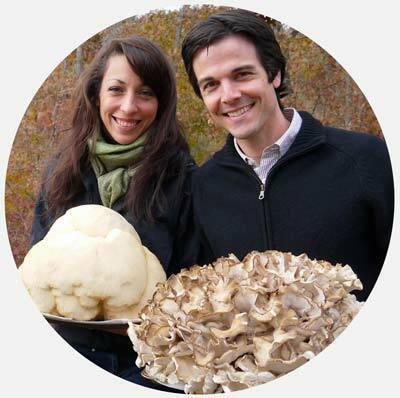 Why do we grow our own gourmet and medicinal mushrooms given the abundance of wild mushrooms in our forests? So that we can still have plenty of our favorite varieties available when we don’t have time to go out foraging. Plus, some of our favorites (like shiitake mushrooms) aren’t native here, so foraging for them isn’t even a possibility. 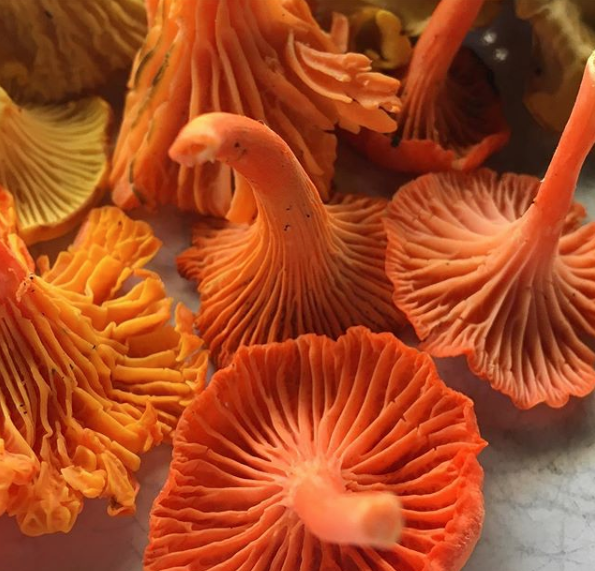 Cinnabar mushrooms (Cantharellus cinnabarinus), a smaller, more colorful subspecies of chanterelle. Cinnabars are mycorrhizal and grow abundantly around certain trees in the summer. Mushrooms come in such a dazzling array of colors, sizes, textures, and flavors, that it’s impossible to make a general statement about them. There are mushrooms that taste like maple syrup, crab meat, steak, apricots & almonds, etc.. If you don’t like mushrooms, it’s likely due to the fact that you haven’t tried ones that suit your tastes yet. Or that you are basing your poor opinion of edible mushrooms off of the rather bland and common button mushrooms found in grocery stores. Mycorrhizal fungi are species that form symbiotic relationships with plants. This trait makes mycorrhizal fungi more difficult to cultivate. 90% of terrestrial plants form mycorrhizal relationships, devoting a significant amount of the energy they produce via photosynthesis to feeding carbohydrates to their fungal partners via the plants’ roots. Popular edible mycorrhizal fungi that you might have heard of/eaten include chanterelles and morels. What makes these mushrooms difficult to cultivate is that they require specific host trees to grow. 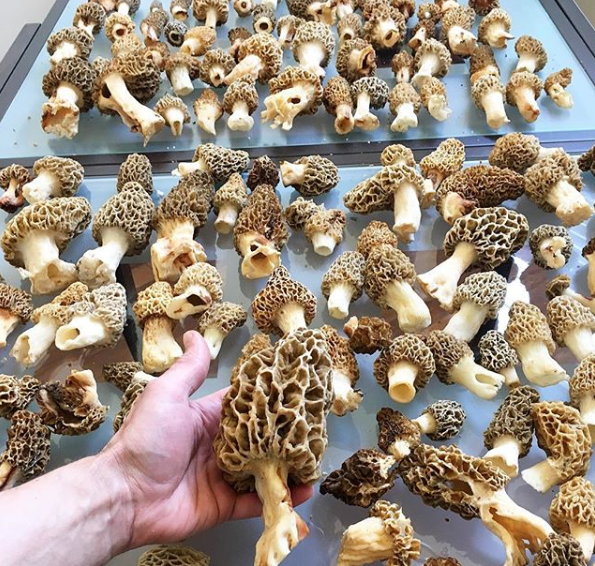 A nice haul of morel mushrooms from undisclosed locations in Upstate South Carolina. Primary decomposers help initiate the decomposition of the tough lignin and cellulose that give trees their structure. As we’ve written about elsewhere, if these fungi had come along a little earlier in earth’s history, we wouldn’t have the abundance of “fossil fuels” that we enjoy today. Secondary decomposers are the fungi that break down organic matter on a forest floor (leaves, sticks, remnants of fallen trees, etc). Tertiary decomposers are the fungi that remain in the soil for years after the primary and secondary decomposers have done their work; they help to break down/recycle remaining soil organic matter so that those components can ultimately be used again as a food source for plants – and the cycle repeats. 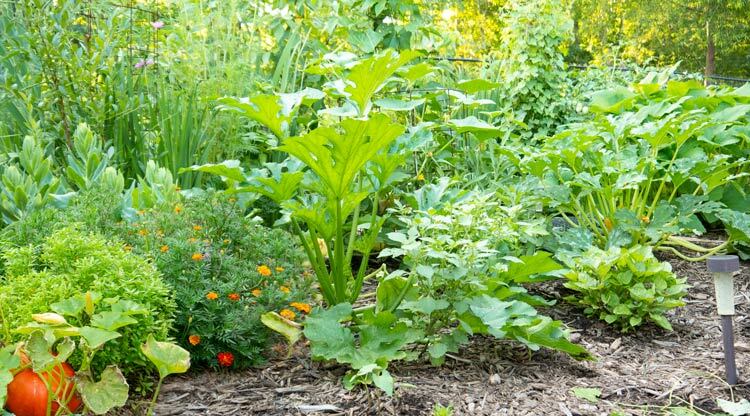 all you need to grow them is either recently felled logs, wood chips, or other carbon-rich waste products. can be purchased as “seeds” on Amazon (affiliate purchase links provided). Some of them even have mind-blowing (and brain building) medicinal properties. They also come with detailed growing instructions from the seller. A massive lion’s mane mushroom growing on a dying oak tree. 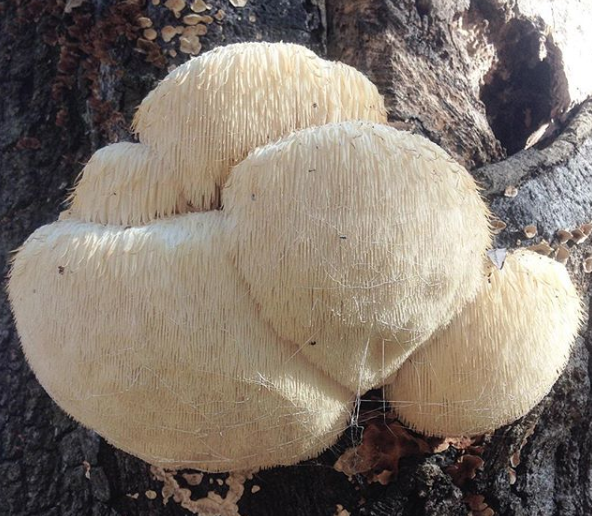 What do lion’s mane mushrooms grow on? Lion’s manes grow on sick or dying trees, cut hardwood logs, or specialized substrate in grow bags. What do lion’s mane mushrooms taste like? The taste and texture of a lion’s mane is remarkably similar to crab meat. Our favorite recipe to make with these is lion’s mane “crab cakes”, substituting chopped pieces of mushroom for crabmeat. We’ve served these to dinner guests and they thought they were eating actual crab meat. What are lion’s mane mushrooms medicinal properties? Perhaps the most potent of all the medicinal mushrooms in this list, lion’s mane and other Hericiums pack quite the punch. Studies are showing that they have very powerful, even regenerative, effects on brain cells, making them a potential treatment for dementia, Alzheimer’s disease, and other degenerative brain disorders. Other proven medicinal benefits: they can reduce blood glucose levels (which can aid in diabetes control), and are packed full of anti-cancer compounds. Read more here. Where are lion’s manes native to and what season do they grow? Native/Seasonal: Lion’s mane is native to North America, Asia, and Europe. 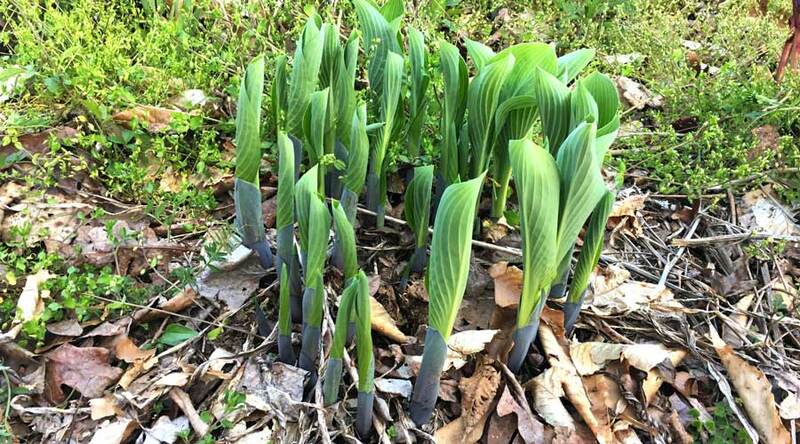 It fruits in the cool seasons, from late summer through winter, with an occasional oddball showing up in the spring. Where to buy lion’s mane? Yes, King Stropharia can really grow this large. This one was about the size of our cat, Oscar. Where do king stropharia mushrooms grow? King stropharia grow on hardwood mulch/wood chips. We inoculated our mulched walking paths and mulched no-till garden beds with King Stropharia mushrooms years ago. We add new wood chips in the spring and fall, and continue to get new king stropharia mushrooms each year. What do king stropharia mushrooms taste like? We think they taste like a combination of portobello mushrooms with notes of white potatoes and red wine. We’re not aware of any research suggesting specific medicinal properties of King Stropharia. 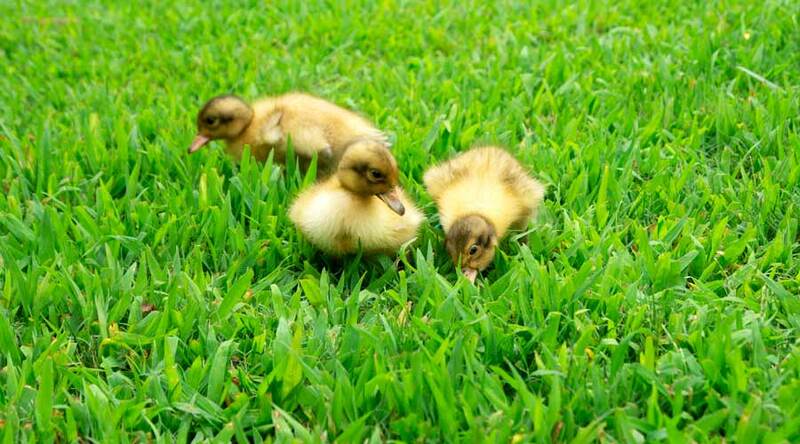 However, they are proven to be an incredible species for bioremediation, e.g. decontaminating the environment. King Stropharia can break down E. coli, coliforms, and other biological contaminants that commonly pollute waterways. 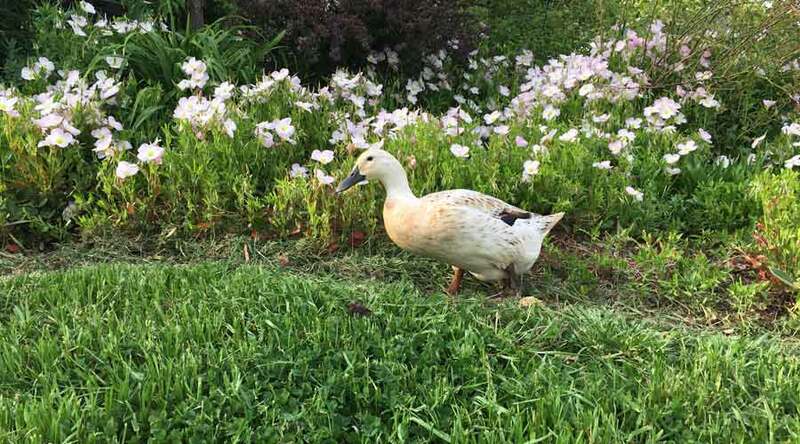 For home bioremediation purposes, put King Stropharia in mulch around your chicken or duck coop, in a grey water filtration system, or in mulched beds between a neighboring property where you’re concerned about contaminated runoff coming on to your property. 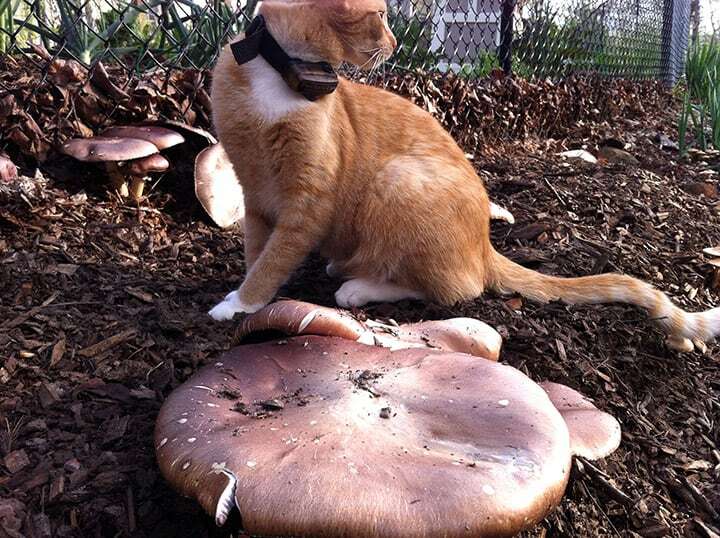 Where are king stropharia mushrooms native to and what seasons do they grow? King stropharia are native to Europe and North America. They fruit in the spring and again in the fall (biggest flushes seem to be in spring). *We’ve written more about these amazing mushrooms here. Where to buy king stropharia? 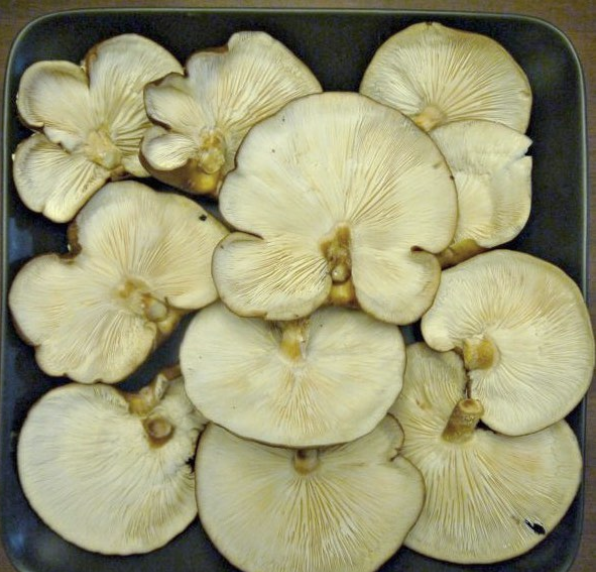 A beautiful haul of cultivated shiitake mushrooms, gill-side up. Where do shiitake mushrooms grow? Shiitakes grow on cut hardwood logs. What do shiitake mushrooms taste like? Shiitakes are mild, delicious, yet meaty. Umami might be the best word to describe their flavor, which is why they are one of the most popular culinary mushrooms in the world. Do shiitake mushrooms have medicinal properties? Yes, research shows shiitakes boost the immune system and can help lower cholesterol and reduce weight gain. Where are shiitakes native and what season do they grow? Shiitakes are native to Asia. There are different shiitake subspecies that fruit at different times of the year – some in cool weather, some in warm weather. 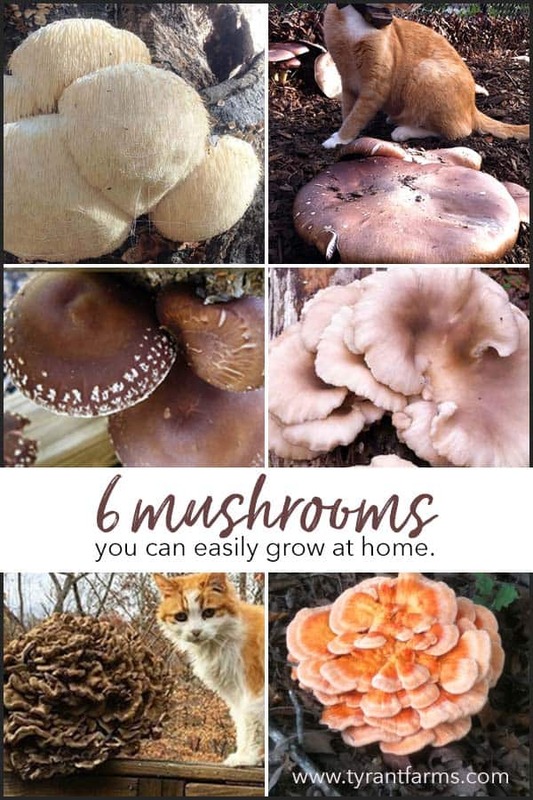 *We’ve written more about how to grow and eat shiitake mushrooms here, including a sunlight trick that allows you to drastically boost their Vitamin D levels. What do maitake mushrooms grow on? Maitakes grow on sick or dying tree bases/roots, cut hardwood logs, or specialized substrate in grow bags. What do maitakes taste like? Maitakes are considered one of the most valued culinary mushrooms in the world, offering a rich umami flavor. We love adding maitake chunks into soup or using it in our soup stocks. Do maitake mushrooms have medicinal properties? Maitake mushrooms simulate both the innate and adaptive immune system, lower blood sugar (good for diabetes), and inhibit cancer cell growth – read more here. 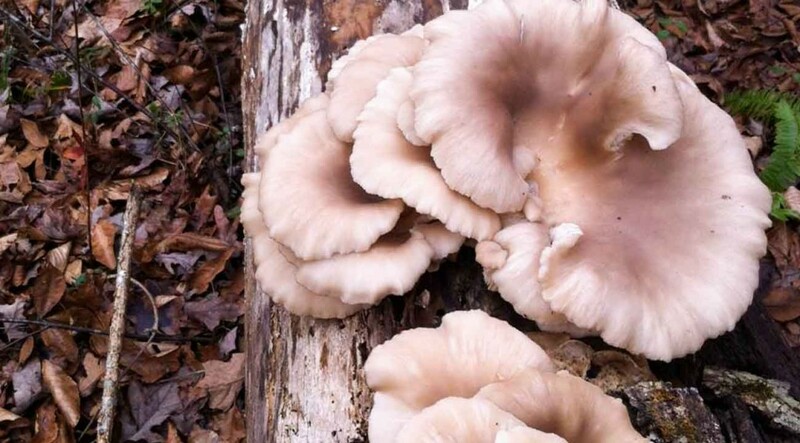 Where are maitake mushrooms native to and what season do they grow in? Maitakes are native to Japan and North America. They fruit in the late summer through fall in our area. 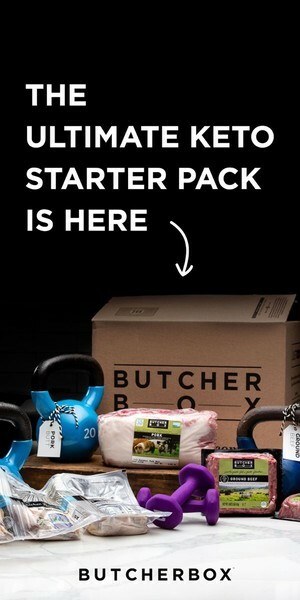 Where to buy maitake mushrooms? A fallen tree in our forest became an oyster mushroom farm. What do oyster mushrooms grow on? Oyster mushrooms grow on cut logs, dead or dying trees, or specialized substrate in grow bags. The name “oyster mushroom” refers to the way it looks, not what it tastes like. The flavor varies by subspecies, but does have a somewhat mild seafood flavor, akin to scallops. All oysters are wonderful but our personal favorite is King Oysters, which are virtually indistinguishable from scallops in flavor. What medicinal properties do oyster mushrooms have? Oyster mushrooms have a list of medicinal properties that are too long to list here. For a detailed analysis, read this research review. 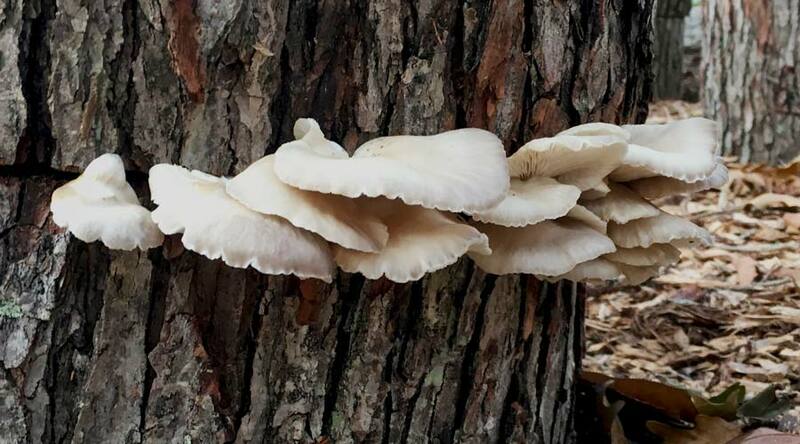 Where are oyster mushrooms native and what season do they grow in? Oyster mushrooms are native to different temperate regions around the world. Like shiitakes, different subspecies of oyster mushrooms grow in different seasons. Our native winter oyster mushrooms fruit throughout the fall and winter here, but other types fruit in the spring and summer. Where to buy oyster mushrooms? 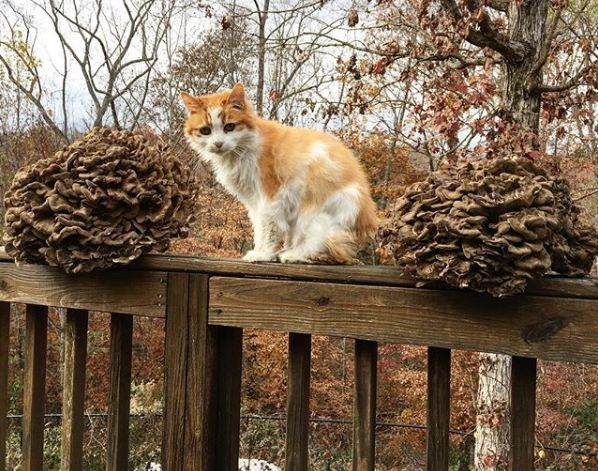 Where does chicken of the wood grow? Chicken of the woods grows on dead or dying trees (some species grow on the tree, some from the underground roots). They also grow on cut hardwood logs or specialized substrate in grow bags. What does chicken of the woods taste like? As the name implies, chicken of the woods actually taste exactly like chicken. They even have the same texture as chicken. We once had friends over and served “chicken fingers.” At the end of the meal when we told them they’d eaten mushrooms, not actual chicken, they couldn’t believe it! Do chicken of the woods mushrooms have medicinal properties? A quick google scholar search will show you a wide range of studies reporting positive medicinal effects including inhibition of gram-positive bacteria and Candida, diabetes prevention/control, and inhibition of HIV-1 reverse transcriptase. Where are chicken of the woods native to and what season do they grow in? There are at least 6 different species referred to as ‘chicken of the woods’. As we’ve written about here, our personal favorite is Laetiporus cincinnatus, but all species are good if you harvest them when they’re young and tender. 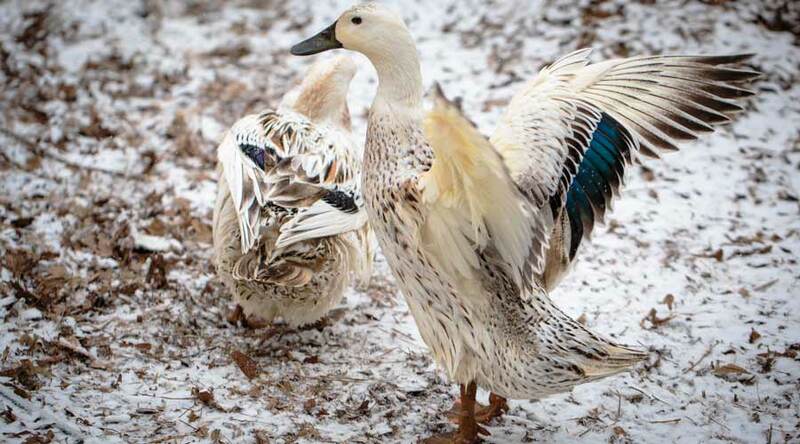 The tips offer the most tender sections. They tend to get a little more tough back towards the base of the fruiting body as they get older. 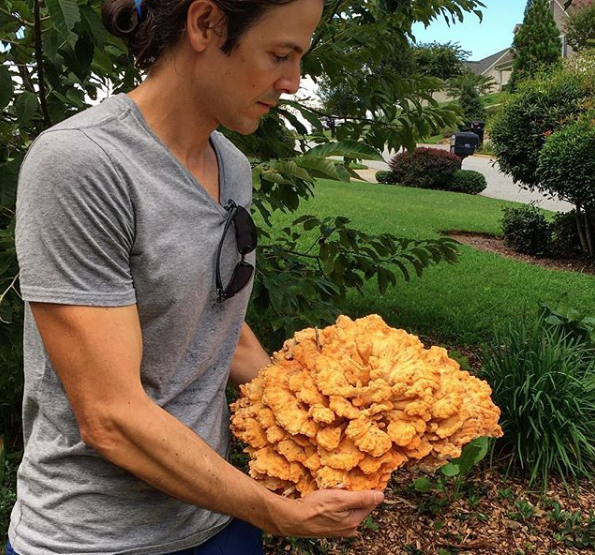 Where to buy chicken of the woods? 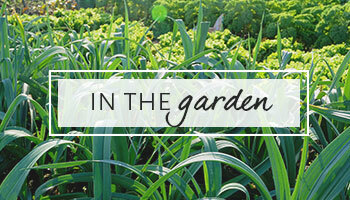 Want to grow your own gourmet food and medicine? Want to turn wood into food and keep it out of landfills? If so, we hope you’ll try growing these six gourmet, medicinal mushrooms! Last thing: if you want to get serious about your mushroom geekery, we’d highly recommend you get this 5-star rated book written by our friend Tradd Cotter, the Yoda of fungi: Organic Mushroom Farming and Mycoremediation: Simple to Advanced and Experimental Techniques for Indoor and Outdoor Cultivation. 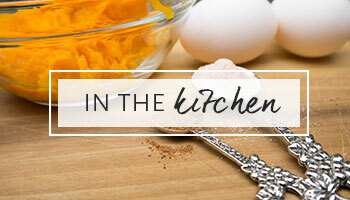 Warning: Be cautious when trying new foods for the first time, especially if you’re prone to food allergies. A small percentage of people are allergic to mushrooms, just like some people are allergic to eggs, nuts, etc. Only try a small portion the first time until you know how your body will react. NEVER eat a mushroom that you’re not 100% certain you’ve correctly identified. There are lots of wild/native mushrooms that can kill you or make you very ill.